Beyoncé and Jay-Z have forked out more than £5 000 on gifts for baby North West, including personalised Christian Dior baby booties. 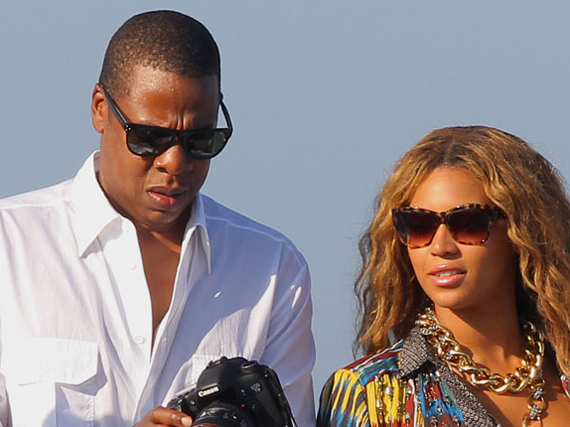 Beyoncé and Jay-Z have splashed out more than £5 000 (R75 000) on presents for Kim Kardashian and Kanye West's baby. The couple ? who have 18-month-old daughter Blue Ivy together ? forked out on an array of lavish gifts for their friends' two-week-old daughter, North, including personalised Christian Dior baby booties and a three-piece sterling silver Elsa Peretti Padova baby set with the tot's name on. A source said, "Kanye is one of Jay-Z's closest friends so he wanted to get the best gift. They've had a girl themselves, so they know the right type of present. "They also brought their baby girl, Blue Ivy, to come over and meet North. "She's old enough now to be really interested in babies." Beyoncé and Jay-Z took the gifts round to Kim's mother, Kris Jenner's, Beverly Hills home, and the pop star gave the Keeping Up with the Kardashians star some advice to help lose the post-pregnancy weight. The source added to The Sun newspaper, "Any bad blood between the ladies has all been brushed under the carpet now Kim's a mom ? Beyoncé was even sharing weight-loss tips with her." Beyoncé and Jay-Z's generosity comes after they sent Kim a £9 000 (R135 000) Swarovski crystal-studded high chair as a baby shower gift last month.